On 15.11.2017 representatives of NGO "Public Advocacy" took part in the meeting of the Working Group of the Universal Periodic Review of the 28th session of the UN Human Rights Council in Geneva. The concern about violations of the UOC rights was also raised by non-governmental organization ADF International (USA), being the leading expert in the sphere of religious freedom in the world, as well as a number of other organizations. In this context the delegation of Greece noted that the state of Ukraine needs to undertake follow-up steps to defend religious rights, journalists and ensure the right of all religious communities based on the autonomy procedures. The delegation of Italy underscored that Ukraine needs to secure free activity of journalists and human rights defenders, while the Dutch delegation stated that crimes against mass media, journalists and human rights defenders should not go unpunished. Therefore, the situation of the UOC communities, the activities of their representatives, as well as journalists and human rights defenders highlighting this issue, received support at the international diplomatic level from the States participating in the meeting. - to ensure the free activity, protection and safety of journalists, human rights defenders and activists, and inform about cases of offenses, including cases and situations of conflicts relating to the Ukrainian Orthodox Church. The listed actions are stipulated by the norms of international law and their implementation is a confirmation of Ukraine's adherence to the rule of law and European democratic values. Thus, the international community, through high-level independent experts, based on information and reports from various sources, established facts of violations of the rights of believers in the Ukrainian Orthodox Church and stated the need for additional and intensive efforts on the part of the state of Ukraine to overcome this negative phenomenon. Attention to the issues of observance of the rights of believers from the delegations of several states testifies that this issue has reached an international level and further violations of rights towards the Ukrainian Orthodox Church cannot be disregarded. Despite the fact that international human rights procedures sometimes take a long time to effectively and publicly respond to the problems of victims, in this case the information received under the UPR procedure of the UN HRC has no statute of limitations and can be used as a source of evidence to bring to justice those responsible for crimes against humanity and other human rights violations. 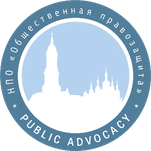 NGO "Public Advocacy" is a human rights non-governmental organization with consultative status within the UN Economic and Social Council, regularly monitors observance of rights and freedoms in the sphere of religion in Ukraine in cooperation with the OSCE SMM and other organizations of the international human rights mechanism.